Straight No ‘days’ to chase Christmas! Some things are just too raw, too private, too tumultuous to share on the spot.I can only cast shadows of who I hope you get to know when I can formulate them into words. … some day. I walked out of the County Courthouse building into swirling wind. It threatened to take my breath away. But who was breathing? The divorce judgement was officially signed, sealed, and delivered. Singlefied. I feel…well, I just feel. There is no way to share the private, raw, swirling set of emotions. They whirl in all directions. They mimic the wind. They feel like the source for the wind. I numbly walk to nowhere. Just like that. A signature on a piece of paper and it is over. This must be what war treaties feel like. The battle is over. I will be shell-shocked for a long time. I am wandering back to my life that will never be the same. This will be a Christmas celebrated without a home…and a home front. We will pour ourselves into our college son’s dinky apartment and hunker toward a New Year. 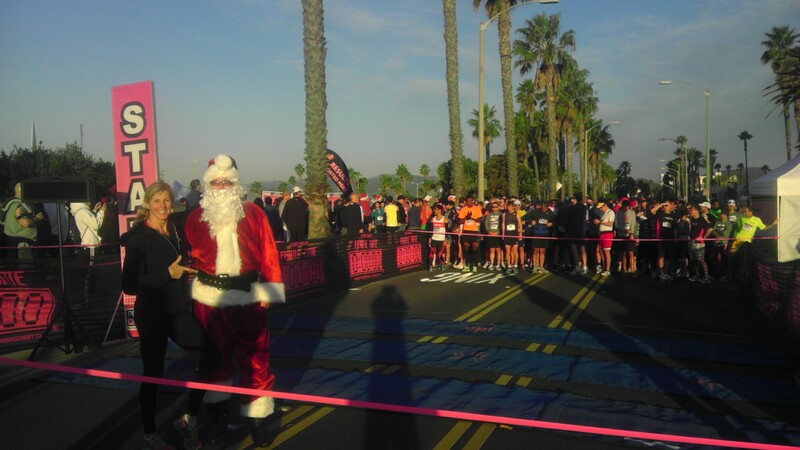 Santa Clausing…a race info commerical. Really? There is a race on Christmas Day. Really. There is some great races in December. 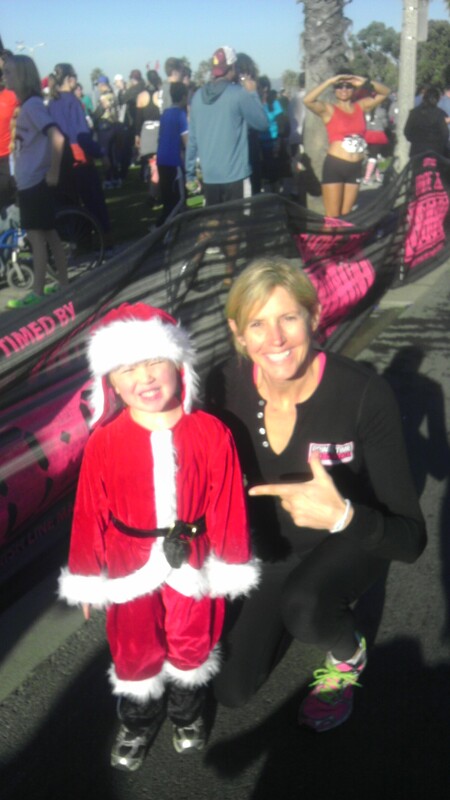 Universal Studios Say No to Drugs run and the Christmas Run had a LOT of chances to sight Santa. And there is even ONE LAST CHANCE to run in December. 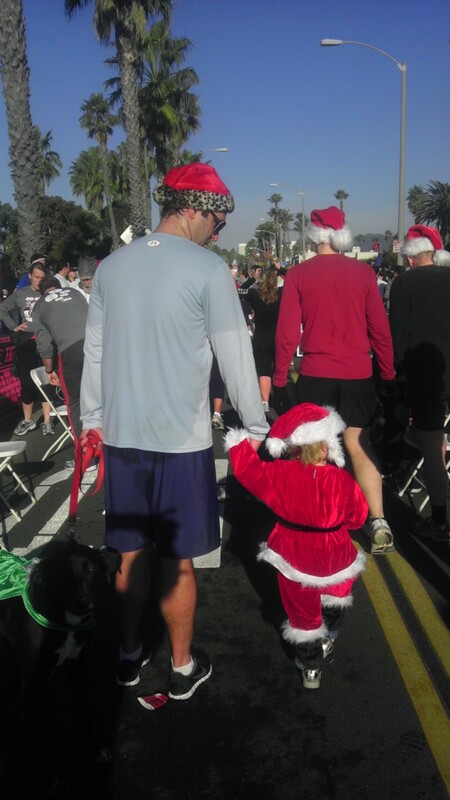 The YuleTide Run in Manhattan Beach is always held on the lowest tide of December. That happens to fall at 3pm on CHRISTMAS DAY this year. So, if you need to run off those pecan pies or build up an appetite for Christmas dinner you have a 3pm and 5pm chance to run on Christmas Day. Find your way to the Manhattan Beach pier and run the hard packed sand along the surf on Christmas Day. 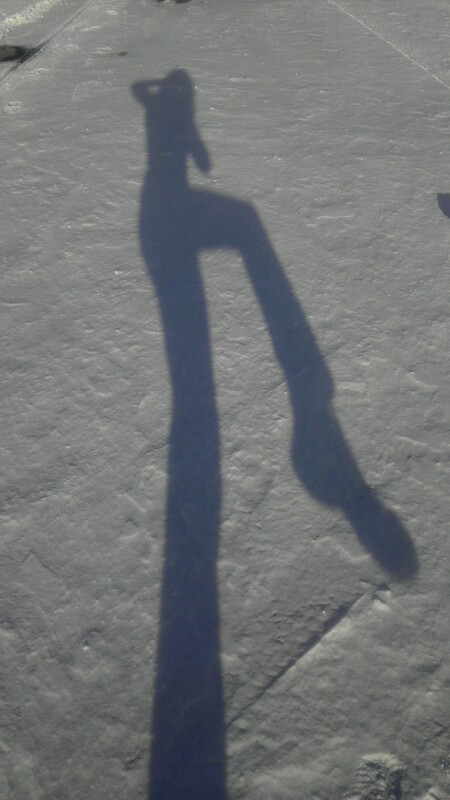 Does Santa dangle his toes in the surf after he leaves all his presents before he heads back to the North pole? Guess we, the timers, are going to get to find out. 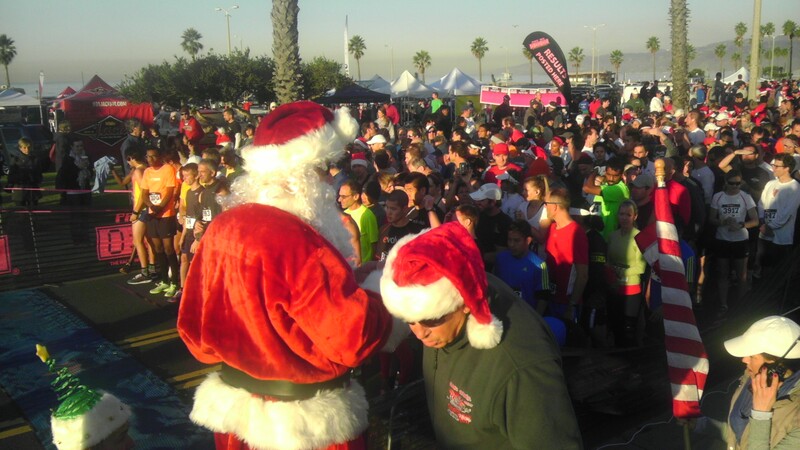 Start of the Venice/Marina Christmas Run. 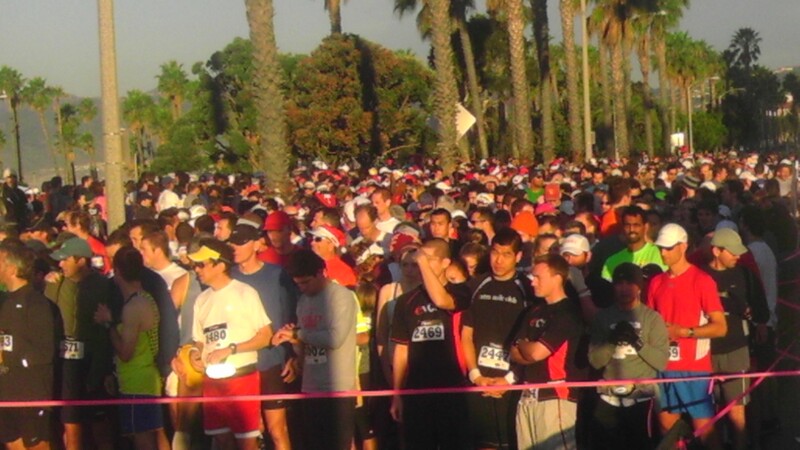 4,100 runners! "Got the Cs & Ds covered, Boss." Thank you, PRIME TIME staff, for doing a super job being professional, friendly,effective, and diligent in covering 2011 races and packet pick ups. Even when Roadrunner Sports liked to ‘hang’ us in the jog bra section of their stores, I heard no complaints. I thank a dear lady named Kathy for opening her home to me on this Thanksgiving afternoon. I did get to arrive in time for hands held around a thoughtfully warm, decorated table full of just as thoughtfully warm and decorated food. I wiggled my way into a family I didn’t even know, but put my hand into and squeezed the special hand next to me. 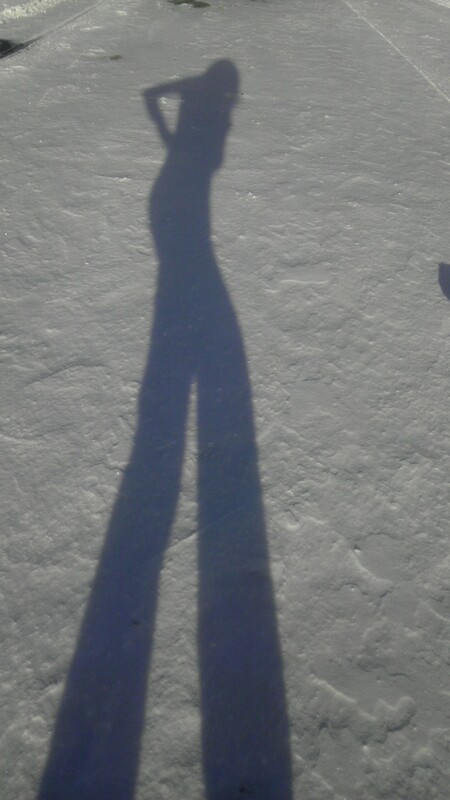 I am THANKFUL for this hand that has helped me get me to higher ground. Thanksgiving Day is the busiest running day in the nation. Everyone throws a community race in their town and grandmas join tots and the entire extended family trots along at any given number of Turkey Trots. This leaves no TIME for turkey though my son and I tried one year. We set the, never been used before, oven timer and proceeded to cook the turkey for 36 hours instead of 6. The black bird went over the deck for the coyotes! And the smoke billowed out the upper window for hours to the tune of the smoke alarm. And we still get to laugh out loud about that burnt bird. This Thanksgiving, we pulled off three very complicated races in three towns. As I got the confirmation via emails and txts that all races were packed up and up on the internet I sighed a sincere thanks. And I was sincerely exhausted. Life tired. I put the key in the ignition to turn the rest of the day into reverence. I was the only vehicle left at the race site when CLICK, CLICK. My faithful friend was letting me down. My shiny, near new, muscled bound Toyota Tundra Truck would not start. 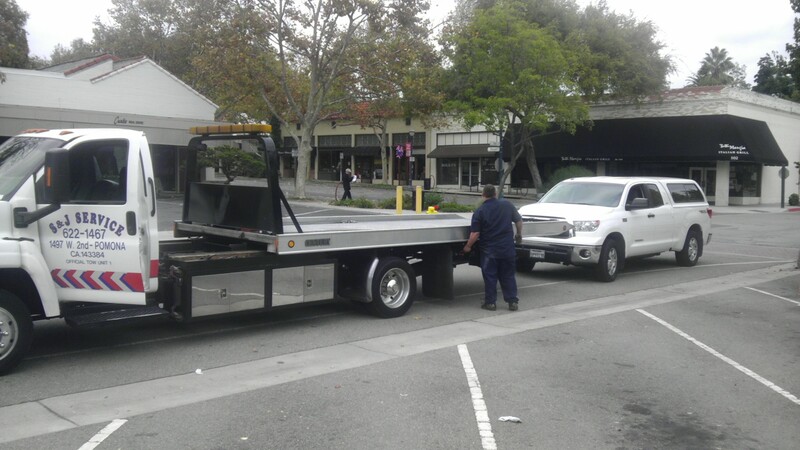 Try to find a towing service available mid-day on Thanksgiving! The starter motor made the malicious decision to seize and I got the stranded opportunity to contemplate the laces in my shoes, stir the leaves in the gutter, and sit through some serious thoughts for the first time in months. Being stranded may be the only way God can get my quiet attention save long runs on an open range, or a mountain road, or the rim of a cliff over crashing surf. I think about Wan, whom I just figured out is spelled Wan instead of Juan. Wan is a very, very good Thai Sports massage therapist that stretches and takes your knots away at Heaven Massage on Ventura Blvd in Sherman Oaks. www.heavenmassageandwellness.com Having meetings and races in that area has allowed me to get to use his expertise routinely during these past few years. I am THANKFUL. Thankful for his willingness to work deep and diligently on a body that knots and ties up by what I demand of it athletically and professionally. Through my prying and his quiet spirited, broken English I have gathered that he works here and sends much of his money back to his family in Thailand. The Thailand that just experienced unprecedented flooding. Wan has shared a few pried out words about a special house that he has been helping build for his family. I asked about the floods and he shared in humbleness that the floods had damaged the house, and more devastatingly…the worker’s factories. That there is no water, eggs, and bread. And now, there are no jobs. But his family was safe. In that he was THANKFUL. Wow. And I just spent the past week lamenting over payments on my business lease, equipment, truck, cars, trailers, college tuitions. And yet. Contemplate. Contemplate. That struggle is real too. And it is an oppression that we want to ignore and call the AMERICAN DREAM… The responsibility placed on us to provide the large enough house, room for every child, car, gas, registration, braces, dance lessons, hockey uniforms, and such. That call is almost an American requirement and yet, it is the very water that is flooding through our families; and many have, are, and will drown. Way too many of us. Sound the ensuing SUNAMI alarm. Like me, so many of us are left this holiday season swept off our feet by the torrent of murky pursuit. We were so busy making it happen, then left too tired and too numbed to swim to safety. SAFETY. Could safety been time spent on self and people and not providing SO MUCH. TOO MUCH TO BE THANKFUL FOR. That’s what stirred through my heart as I stirred the mildewed leaves as the water trickled by in the gutter. CLICK. CLICK. You big, bad, new truck. You weren’t supposed to leave me stranded.